Today I’m bringing you guys a recipe of Chocolate overload! 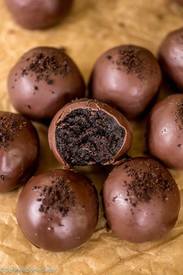 Being a chocolate fanatic myself, I just cannot get enough of these easy oreo truffles! They can be whipped up from start to finish in less than an hour and just trust me when you take a bite, you will not be able to stop at just one! One, two, three… and rest is history. Or maybe that’s just me? I usually substitute the wafers for real tempered chocolate- makes them oh so much prettier!